The new interoperability is upon us. Healthcare data, once confined to a single hospital or system, are increasingly moving more freely outside the constraints of an electronic health record system, giving patients added control over their care and arming providers with the information they need to close gaps in care. The data are moving more easily thanks to interoperability driven not by EHR technology but by the standards supporting the systems. This new type of data exchange looks different from that of the past. It's more comprehensive, with data traveling as discrete elements, rather than in clunky PDFs. It's also more widespread. Most importantly, this kind of interoperability is made possible by an increasingly powerful player in the game of healthcare: the patient. "There is a new opportunity to share data by sharing it with patients," said Dr. David Blumenthal, president of the Commonwealth Fund and former national coordinator for health information technology at HHS. Federal regulators agree. Last week, the CMS announced a proposed rule to make over meaningful use to give patients more control over their health information. But aside from a name change—the program is now called "promoting interoperability"—details were slim. The proposal, part of the massive inpatient and long-term care prospective payment rule, reflects a new notion of interoperability: If patients hold their own health data, the thinking goes, they could be the means of interoperability—the central hub tying together various providers and relevant parties. Developers can use an application programming interface, or API, to build software applications that use standardized rules for telling software components how to interact with one another. That way, those components can share data and functions. Open APIs, as opposed to private APIs, are those that have been released publicly for developers to use. For example, with Doctors on Demand, physicians can send a patient's prescription to the nearest pharmacy. To show the closest pharmacies on a map within the Doctors on Demand app, the company relies on Google Maps APIs. That carries the side benefit of feeding the drive toward care centered around patients as consumers. With healthcare organizations' leaders increasingly taking a consumer-focused approach, they're realizing part of that is giving patients what they want. 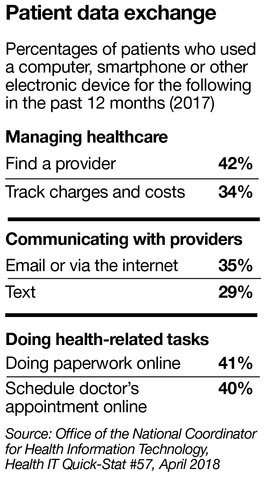 And more and more, patients want both access to and ownership of their health data. That's reflected in consumer use of mobile health apps, which has risen to 48% of respondents surveyed by Accenture from 16% of those surveyed in 2014. Those apps aren't useful running on their own, though. It's optimal when the data can smoothly move from patient to provider and back again. Achieving that kind of interoperability, which has eluded the healthcare IT world so far, won't happen overnight. It'll require vendors, providers and patients to understand both the uses of and business reasons behind patient-directed data exchange. But before data can be exchanged, those involved have to agree on computer standards for doing so. That way, when the health data move from one system to another, they can be ingested and processed by computers, rather than manually transferred into new records. "Health data standardization is not so unlike trying to achieve world peace," said Dr. Shaun Grannis, director of the Regenstrief Institute's Center for Biomedical Informatics. Everyone wants it, but no one is sure how to get there. Indeed, standards are all the rage these days, with interest driven by the promise that standardization will not only enable data exchange but also make the data more useful. Among the organizations promoting interoperability are the Veterans Affairs Department, which is pushing open application program interfaces, or APIs, and Apple, which is endorsing and using a standard called Fast Healthcare Interoperability Resources, or FHIR (pronounced "fire"). Apple right now has more or less become the standard-bearer for FHIR and interoperability. The full effects of the tech company's release of a version of its Health app—which lets patients download their records from health systems to their iPhones—has yet to be felt. "The exciting part of what Apple's doing is it consumerizes what is generally a very difficult and technical process," said Dr. John Halamka, chief information officer at Beth Israel Deaconess Medical Center in Boston. And the demand is there, he said. "With employees bearing a greater and greater share of healthcare expenses, I see more and more people getting involved in the management of their own data, because it's in their financial interest to do so." Data on Apple's Health app use the FHIR standards, so the information, in theory, is interoperable. "You could imagine that because of Apple's presence, and because there could be a lot of customer demand from the patient side, that will generate the kind of demand we don't usually see in healthcare, which is from patients," said Micky Tripathi, CEO of the Massachusetts eHealth Collaborative, a not-for-profit health IT organization. "That will indirectly help enforce this set of FHIR standards, which is great. It could really accelerate FHIR, because providers want to be associated with Apple connectivity." "From a technology perspective, working with the largest technology company in the world never hurts," said Dr. Alistair Erskine, chief informatics officer of Geisinger Health, one of the first systems to sign on. The value is also in improving patient care and patient engagement. "Apple is obsessed with the customer experience," Erskine said. "Healthcare could use a lot more savviness when it comes to the patient experience. We're hoping they could rub off on us a little and teach us how to design things in ways that are delightful to patients." The idea is that, by letting data move freely across platforms, developers could connect their apps to existing EHRs so patients and providers could better access data. One way of doing this is by employing open APIs, which let pieces of software exchange information and services. The government has been pushing EHR vendors to adopt open APIs; in the 21st Century Cures Act, for instance, lawmakers mandated EHR vendors use them to make patient data available "without special effort." "The open API will speed the innovation and adoption of interoperability," said John Gresham, vice president and general manager of DeviceWorks and interoperability at Cerner Corp. The VA, for its part, has launched the Open API Pledge, which 13 health systems had signed on to as of late April. The early support for the pledge is promising, VA Secretary Dr. David Shulkin said shortly before he was ousted from his post. "When you have those systems publicly committed, we believe there becomes a market force that says to the industry and other providers and communities that together, we are committed to achieving interoperability for patients," Shulkin said. The hope is that by adopting open APIs, providers and vendors will open up access to patient data across systems. "We believe that the EHR vendors who are customer-responsible and looking to the future will see that the old strategies of preventing interoperability because of business reasons are no longer applicable," Shulkin said. So far, vendors have been slow to act, and patients and providers alike are losing patience with the pace of change. They're demanding something better. That demand may be working in interoperability's favor. As interoperability is stymied by providers who don't want to share their patients' data because they fear competition and vendors who are afraid of the same thing and have closed off their systems, patients are stepping in. "The requirement to exchange information is not consistent with our idea of market competition," Blumenthal said. "We believe that, on the one hand, healthcare should be like every other market, and people should be ferociously competing. On the other hand, we believe people should be acting like professionals and putting their patients' interests above their own." Simply put, he said, these models can't co-exist. Now that there are massive amounts of healthcare data, though, demand for access to it is increasing—and some of that demand is coming from patients themselves. "Patients have a right to an electronic version of their data," Blumenthal said. "Providers can just give the data to the patient," he said. "This is a backdoor way of short-circuiting the whole question of whether providers will exchange data." Notably, Apple has taken this backdoor approach with its Health app. Not only are the data in the app technically interoperable, thanks to FHIR, they're also potentially longitudinal. That means providers can use the information to get a better picture of the patient's complete healthcare timeline—something that's harder to do in a single, limited EHR system. Google (now Alphabet) tried something similar in 2008 with Google Health, a personal health record that was supposed to allow people to aggregate all their health records in one place. But data exchange troubles and a lack of demand thwarted the project. Similarly, Microsoft Corp. has tried to give consumers a personal health record with its HealthVault, launched in 2007. The service has been slow to take off, though. Now, with Apple's entrance into health records, some expect Samsung to follow suit, encouraging the same kind of use for Android phone customers. Letting Apple and patients do the legwork removes a lot of the burden of data exchange, Erskine said. When patients pull their own data, they necessarily are matched to the correct records, and they serve as the HIPAA authority. "If patients can do all that by themselves, all that overhead that's currently an impediment to the flow of clinical data goes away." Traditional EHR vendors are working with Apple to make this possible. Those partnerships may expand. "If Apple had partnerships with institutions and Epic so that any Epic institution could work easily with Apple, you could imagine a new route to exchange for Epic clients," Blumenthal said. That route would be the patient. The federal government, too, has its eye on the patient as a means of data exchange. With the new proposed rule, regulators are building on MyHealthEData, an initiative announced by CMS Administrator Seema Verma in March to give patients more control over their own health information by putting it on any device. "It's almost as though we've come full circle to the idea of the smart card," said John Kelly, principal business adviser for software firm Edifecs, referring to the idea of a physical card that would hold a patient's medical history and let providers update that information. "When the patient becomes the agent of interoperability, a lot of the other stuff becomes moot," Kelly said. "Now you've completely bypassed all the problems with the EHRs talking to one another. It changes the game completely." If all goes according to plan, or at least close to it, these initiatives could help advance value-based care models, Kelly said. "If payers and providers and employer groups start sharing the information that would create value-based reimbursement models, that would drive real cost savings," he said. These initiatives would also drive patient engagement. "You have this additional benefit that the patient is no longer a spectator of their record—they become the owner of that record," Erskine said. The EHR market might ultimately look different, too. "If you democratize the information and the flow of it, then suddenly it's hard for a limited number of oligarchs to control the market," Kelly said. Before that can happen, there are still technical and logistical kinks to be worked out. How, for instance, will patients get their information back into the EHR software on which health systems so heavily depend? 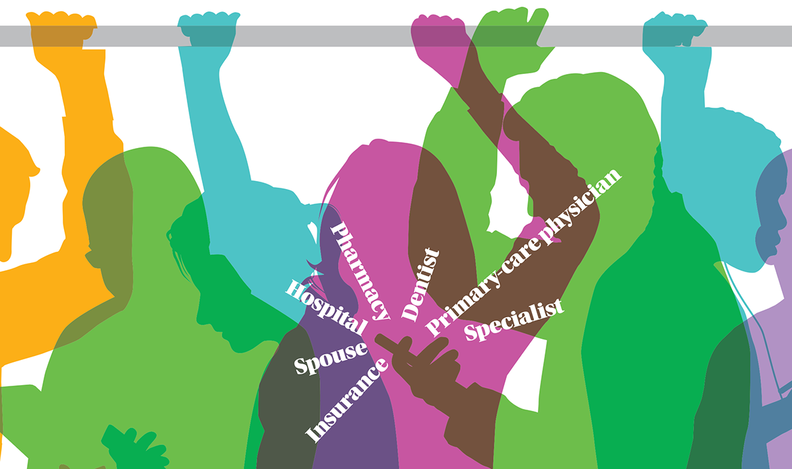 "The industry needs to integrate that back into a longitudinal care plan," Gresham said. Meanwhile, the industry can't forget provider-to-provider interoperability. "It's not a single solution that will solve it all," Gresham said. "You can't discount the value of having care providers being able to exchange data with other providers." Some are skeptical that patient-directed interoperability will be a big deal in the first place, particularly some of those working in the EHR industry. "I don't think this push is going to make a big difference," said Dr. Charles Jaffe, CEO of standards organization Health Level 7, which oversees FHIR. "It will matter a great deal to a very small group of people." Even so, as the early adopters gain control over their data, new business models arise—as do new security concerns. Whereas the business case for health information exchanges never quite made sense, Erskine said, the business case for patient-controlled data does. "If I as a patient own data that a device company or a pharmaceutical company wants to be able to interact with and is willing to pay me for, all of a sudden there may be a way for patients themselves to monetize it and for pharmaceuticals to build a business case," he said. Drug companies would be able to spend less on the data they're already purchasing, and patients would be able to make some extra cash. Health Wizz, for example, has a patient-data aggregation platform for patients to trade and sell their data to drug companies, researchers and others in exchange for a cryptocurrency. This flips the existing market for patient data in which middlemen buy patient data from health systems, pharmacies and EHR vendors, though it is not yet clear if that business model is viable. While there are opportunities in this kind of data-sharing, there are also risks. Any time more data move to more places, more potential breach pathways inherently open up. "Our major focus with this is to make sure it's done responsibly," said Dave Fuhrmann, vice president of interoperability for Epic Systems Corp. "If I'm logged into an application and I authorize it to download my record, that application doesn't necessarily have to follow those same rules." So, for instance, if a patient downloads all her health information into one app on a smartphone, she might unknowingly consent to granting another app access. If neither app's developer is a covered entity or managing protected health information on a covered entity's behalf, then HIPAA privacy and security rules don't apply, and the information is free to travel. As such, providers, vendors and app makers alike must make sure patients have the right expectations, and they must also make sure that patients are giving the right consent to use their data. "Once your data is out there," Fuhrmann said, "it's very hard to pull it back."